The beauty of the Ongals’ performance is in not understanding a single word they say. “Four rather large grown men are dressed like a baby and babble like them. With kids, we have to watch closely to see if they are hungry or sick. Likewise, the audience tends to focus more to see what we’re up to when we’re performing,” said Cho Jun-woo, the leader of Korean comedy performance team Ongals. Ongals -- named after Korean word “Ongali” meaning babbling -- resemble rosy-cheeked infants in colorful clothing, uttering incomprehensible gibberish and playfully interacting each other. The team consists of Cho, Jo Su-won, Chae Kyeong-sun and Choi Ki-sup. But the comedic value of the quartet lies in an array of impressive acts they perform using everyday objects and gimmicks literally from their box of tricks. With minimal props like cardboard cutouts, sound effects made with their mouths and physical comedy, the team is able to simulate a motorcycle ride, a nightclub experience, and a re-enactment of the “Transformers” movie on stage. The brilliance of Ongals, however, is that their hilarity is made possible without uttering a single sentence. This has allowed the team to extend beyond Korea to performing in other countries such as the UK and Australia. The original Ongals team -- consisting of Cho, Jo and Chae -- was created in 2007 as part of Korea’s longest running TV comedy show “Gag Concert.” Seeing the potential for their gig, the trio left the stable platform to perform live on stage. This was when Choi -- then a comedian for SBS channel -- joined the team. Making the transition to the foreign stages was not easy, Ongals noted. Unlike K-pop and Korean dramas that have become the backbone of Hallyu, K-comedy was an obscure realm. As none of the Korean comedians had made the jump to foreign stages, the four had nowhere to turn to. 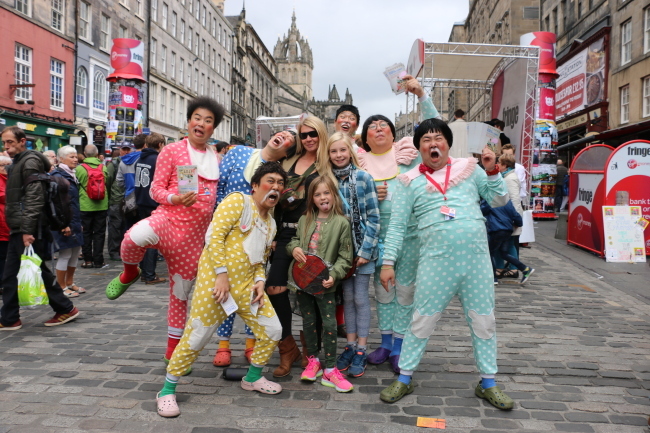 Deciding to test the foreign audience at the Edinburgh Festival Fringe, the quartet visited the festival as tourists in 2009. “We were unsure because of the cultural differences... So we watched three to five performances every day,” said Cho. Choi said that he never thought they would fail. “Nobody starts running the 100-yard dash thinking he’s going to finish last. Our thoughts were: let’s give it a go and if it doesn’t pay off, so be it,” he said. “We were never worried about the content, because we’ve always been ready. The issue was -- and still is -- the costs of travelling. But we know that once we hit the stage, we’re going to kill it,” said Choi. The high-energetic performance of Ongals is thoroughly prepared through hours of practice. But many of the repertory is also completed on stage, on the spot. One example of such tweaks was Cho’s knife juggling performance that has now became a part of Ongals’ finale. “The knife originally comes out only when the crowd demands an encore, but (Cho) grabbed it first. So, now it’s part of our regular performance,” said Jo Su-won. Cho said that unlike many other Korean comedy shows, Ongals’ members perform and direct their own shows, giving them a sense of responsibility. Doing a comedy show in foreign lands is no mean feat by any means. Performing in front of a crowd with different cultural backgrounds had some embarrassing moments. “In Brazil, it was the ‘OK’ sign. Because one of the most commonly used gesture was a foul one there. So whenever we visit other countries, we have to study up,” Cho said. The team was also advised not to use a knife in a “family” show in UK, although using a whip --which the team thought was scarier -- was A-OK.
“We learned of many cultural taboos, like not to look directly into a woman’s eyes in Dubai. Over time, we learned to exclude those things from our shows, so there’s not much problem now. But a more dire issue was money. “It is an honor to perform at the Edinburgh festival due to its size and history, but we have to pay for the trip ourselves so there’s a lot of pressure,” said Jo. The babbling comedians are to perform at the Fringe from Aug. 2-28, and will do its first long run at the world-famous stage of West End in London later this year. “While we were invited to the West End, the five-week stay will cost considerably. We decided to go because of what the stage symbolizes, but we’re in quite a pickle financially,” said Cho, adding none of the members are expecting to be paid until the West End. “The West End has always been our dream. But we are looking for sponsors. It used to be that just our dreams would be enough, but now we have to think about financial issues,” Jo chimed in. Despite being acclaimed overseas -- it won 2014 directors’ choice award on special commendation at Melbourne International Comedy Festival -- Ongals continues to face difficulty back home due to the public’s perception about comedy. As pioneers, Onglas said that they are confident that people’s perception toward comedy will change. “But for the people in the middle of the process, it is very difficult,” said Jo. While originally started as a quartet, Ongals now has three young, aspiring comedians as back-ups: Lee Gyeong-seop, Choi Jin-yeong and Ha Bak. “I have great expectations that one day, we will all be on the bigger stage,” he said. “Us all having the same dream, and moving toward it without backing down, and having our own content, that’s what makes us who we are,” said Ha. Choi said that despite what the team has been through, they have only scratched the surface on reaching their goal. “We’re not just getting ready to climb the mountain, not even close to our dreams. Rather than to focus on the difficulties, we would rather think about what we should do to get more things done,” he said. Ongals said it hopes to perform regularly in Korea, the UK, US cities like Las Vegas and other places around the world. It added that the name Ongals will live beyond the seven members’ careers to become a lasting brand. “My biggest dream is that even when we (original four members) cannot perform anymore, our other members will be on stage. And when they too cannot be on stage, other members will. If Ongals becomes a brand that lasts, even if we cannot go on stage, we are essentially on it,” said Cho.